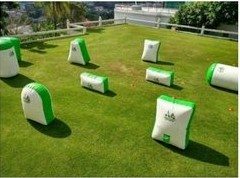 Bucks party ideas in Sydney - Play Archery Attack! Been spending ages searching for bucks party ideas in Sydney? Well, good news – your search is over! Archery Attack is a chance to find the hidden Ninja amongst you. Just imagine how many times you’ll be able to recount that magical* arrow that swerved in the air, glanced off one of our inflatable bunkers and hit home – square between the eyes – from 30 metres! We think Archery Attack is a cracking activity to play before you get onto the serious business of drinking beer. But don’t take our word for it, shoot this over to the best man (sorry, we couldn’t resist!) and we’ll help you make Archery Attack the best Bucks Party idea in Sydney ever! * disclaimer: our arrows aren’t magical.. that’s the beer talking. Some of the fun from the Melbourne Indoor warehouse! That’s enough for me, I’m in! We understand going from Bucks Party idea to reality can feel like herding cats. So we handle everything so all you need to do is turn up (fancy dress optional). Once you get in contact and give us the time, place and approximate numbers we take over from there. We’ll take care of the organisational side of your event, keeping you updated the entire way. We have loads of locations around Sydney that we’ve hosted Archery Attack events. Northern Beaches, Western and Eastern Suburbs and the Sutherland-shire – we’ve played across all so we can help suggest venues if you don’t already have one in mind. Choosing your Archery Attack event with us will mean you’ll get the event that you wanted with minimal fuss. Did we mention that we don’t charge any fees for doing the leg work either? In the lead up to your wedding day there are hundreds of decisions to made.. what colours flowers for the corsages, who’s going to sit next to who, what will the first song be, what’s a corsage? But the Bucks Party is no time for things like this..
On this day IMPORTANT decisions need to be made, often with life-threatening consequences. Where are the beers, who’s got the rum, what pub are we going to next, how many people are playing Archery Attack? We can’t help you with all of those but we can usually accommodate for changes to the numbers at short notice as we know you won’t get the exact numbers until the last minute! Also, because were are fully mobile we can set up at an area close to where you plan to spend the rest of the day and night. We can turn even the most level, boring green grass park into an awesome Archery Attack battlefield! It’s not every day that a mate is getting married and it’s not every day that you can legally use a bow to shoot arrows at another human. Put the two together and you can see what makes Archery Attack a unique and great idea for a Bucks Party in Sydney. We’ve got a heap of games to keep everyone entertained and also a set of special games to “congratulate” the Buck on this fantastic milestone. How Archery Attack says “congratulations”! With our protective equipment you’ll be able to continue the Bucks Party into the evening and early hours of the morning! However, protection from the hangover is not included. Pricing starts at $39 per person for a 1 hour event. Check out pricing and group options on the Sydney location page.